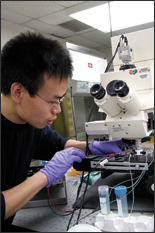 Xiaolong Luo, one of the graduate students working on this research. A cross-disciplinary research team at the University of Maryland has shown for the first time that their microscopic drug research platform can produce the chemical reactions needed to test potential drugs. After researchers placed an enzyme on a tiny "biochip" created to mimic the environment within the human body, the enzyme performed as it normally would. This means that the researchers can proceed to the next step--testing new drugs to see, for instance, how effectively they can inhibit bacteria like E. coli. This advance builds on prior work by the team, which brings together expertise in bioengineering, biomolecular engineering, materials science, and electrical and computer engineering at the Clark School and the University of Maryland Biotechnology Institute (UMBI). The researchers have developed the biochip, a programmable biological microfactory, which will be used to test drugs and eventually deliver them where they are needed. "We have now demonstrated perhaps the key advance needed to realize what we seek, a powerful laboratory tool for drug discovery," said Gary Rubloff, professor in the Clark School's Department of Materials Science and Engineering and Institute for Systems Research (ISR), director of the Maryland NanoCenter, and a member of the research team. "Using biochip microfactories, we believe it will be possible to test potential drugs," Rubloff said. "We hope to enable scientists and physicians to create better, more effective drugs more rapidly and at reduced cost." The microfactory allows the researchers to manipulate substances using fluid, electrical and optical means. For instance, the researchers used electrical voltage to place a substance called chitosan on the biochip. Chitosan serves as a platform for assembling biomolecules. One targeted application of the microfactory is to develop drugs that can interrupt a process called "quorum-sensing." In quorum-sensing, bacteria cells, such as E. coli, communicate with each other to form a quorum or group capable of creating an infection. The team has already demonstrated that it is possible to interrupt this quorum-sensing ability or to introduce new communication to ultimately prevent such infections. Candidate drugs will be applied in the microfactory to test their ability to suppress or interrupt quorum-sensing. Drugs that succeed will not only serve as good candidates for new antibiotics, but they promise a new strategy for antibiotic therapy. "Since the drugs won't kill the bacteria, the bacteria won't be stimulated to mutate, which renders too many antibiotics no longer effective, since the mutated bacterial strains are not killed any more by the original antibiotic," Rubloff said. The team envisions the use of programmable biological microfactories as tools for rapid screening and development of new drugs prior to time-consuming, expensive clinical trials. "Any lab screening that is faster or more efficient in identifying new drugs could also reduce drug costs and time to market," Rubloff said. This development advances research funded by the Robert W. Deutsch Foundation and a National Science Foundation Emerging Frontiers in Research and Innovation grant of $2 million awarded to Rubloff; Greg Payne, director of the UMBI's Center for Biosystems Research; Reza Ghodssi, associate professor with the Clark School's electrical and computer engineering department and ISR; and William Bentley, Robert E. Fischell Distinguished Professor and chair of the Fischell Department of Bioengineering. A related press release on this project is available online. "We have now demonstrated perhaps the key advance needed to realize what we seek, a powerful laboratory tool for drug discovery."